At the beginning of this week, 7th September 09, we saw on the Australian Dollar forecast that it was bullish on all three of our main swing periods. That is the two day swing, seven day swing and the one day swing. This indicated that we needed to be alert for a possible long entry. I entered a long position today the 11 September as I saw on the chart that price moved over the natural square level of 0.8600. My stop loss is just below today's high at 0.8550. If price moves down under this level it will mean that there is weakness in the price as it is under the natural square level. If that were to happen I would not want to remain in the position. (I would look for another re-entry if my stop is hit and price closes above the 0.8600 level). I anticipate next week to be a bullish week for the Aussie dollar, Euro and Pound. If the US Stock market keeps moving up over the next few days we will see this bullish forecast hold true. We want the DJIA to remain above 9600 points. If it slides under this level, it will drag down these currencies too as the markets are all interrelated. 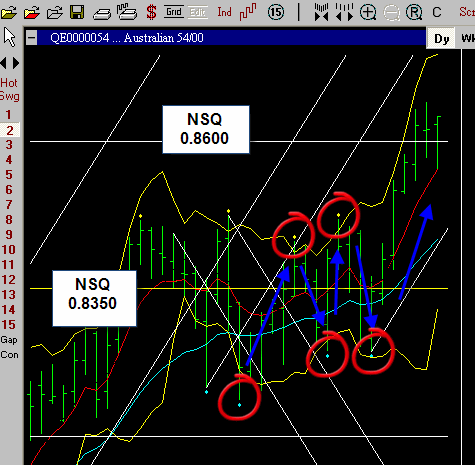 AUDUSD Daily Chart 11 September 09.